Together with two good friends - Lukas Irmler and Christian Krr - Alex went on a 2-month highline trip to the country of the origin of slacklining - the USA - in winter 2011/2012. We landed in San Fransisco in the middle of November 2011. Unfortunately there was already too much snow in Yosemity Valley (the cradle of slacklining) to rig slacklines. 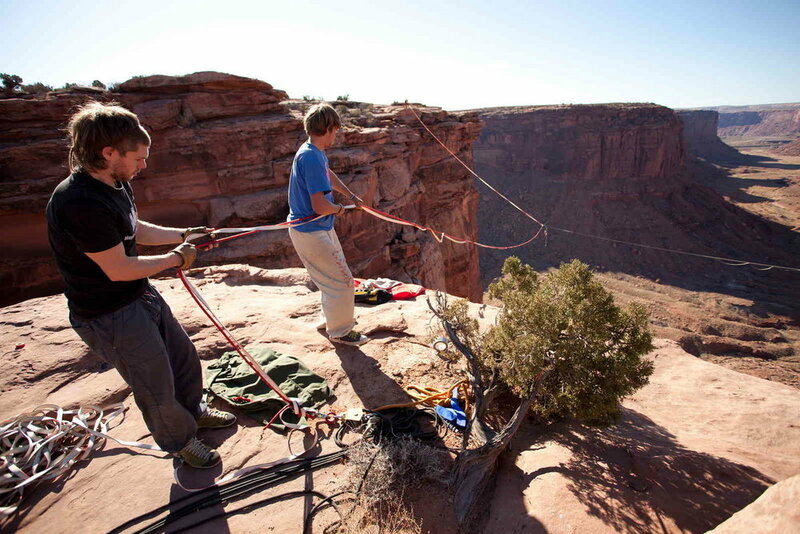 However, we could deal with that, as there are enough other great places for highlining in the states. The area around Moab, which is well-known for its unique rock formations and sandy deserts, offers almost unlimited potential. So we spent the first half of our trip in this “Mecca for highliners”. We camped at the edge of the canyons during the first ten days, where more than 50 highliners from all over the world came together to pursue their passion together. This location with its depth and breadth in connection with an easy set up of the lines was perfect for it. During the meeting ten highlines were rigged, from the beginner's line of ten meters to the world record line of 127 meters. After Jerry and I had to realize that we couldn't break our world record on that line, I focused on a new project: the “space anchor highline” or in short “space line”. The idea came from the so-called “slackline spiderweb”, where several slacklines from different anchor points are connected in the middle in a way that resembles a spider web. This kind of slacklines had existed up to then only close to ground level. With the help of some other motivated highliners I succeeded in transferring that principle to highlines. So we rigged and walked the first space line of the world. The main difference between a space line and a normal highline is that one anchor point moves and that you don't walk towards a fixed anchor point at least on one of the lines (there are at least three) but virtually into the void. The combination of the swinging anchor point and the unaccustomed view into the void make the space line much more demanding than a normal highline. You can feel the unfamiliar swinging and the exposure from the very beginning, but with every step towards the middle both the swinging and the feeling of exposure become stronger. You must concentrate more and more with each step you take while you have to cope with the expanse of the canyon. The last steps are the most difficult ones. Never before had I experienced that feeling of total exposure while walking and especially when arriving at the space anchor (=the connecting point of the lines). In addition to the 35 meter long line, which went out into the canyon, I also tackled the circa 60 meter long part. However, the attempt to walk all three lines simultaneously was not successful due to a lack of time and the huge dimensions of the space lines. But when we rigged a smaller space line in another “bowl” a week later, we were happy about such a “three way send”. Walking a space line simultaneously together is a very special experience. Any mistake you make can destabilize your two mates. If you fall, the other two highliners have no chance of staying on the line. When we joined our hands at the space anchor point already at our first attempt, we were of course overjoyed about the success of our teamwork. The “Corona Arch” highline was the most beautiful one for me. As it is rigged in a natural arch, it has a very special atmosphere. View here for a slide show of the action. 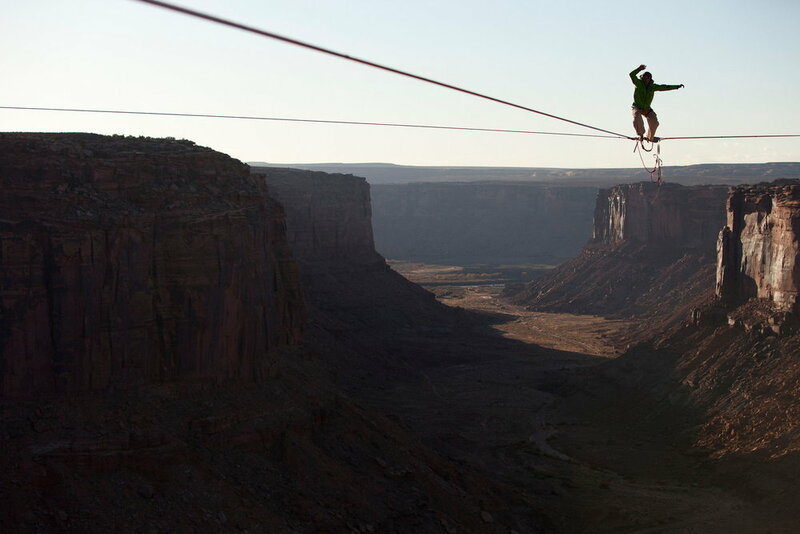 Another highlight was the first ascent of the 80 meter long “American way of life” highline. And last but not least Lukas and I were walking the two highlines at the 100 meter high Lighthouse Tower, when Andy Lewis and Richard Webb flew past us with their BASE-Rigs. When we derigged the highlines, it started to snow. So we agreed that time had come for a change of locations. While Lukas and I took the train, Christian hitchhiked to beautifully warm California. To be more precise, we went back to Jerry's, with whom we went to the Backyard Highline Meeting in Garden Valley the next morning. At this meeting six highlilnes were rigged between trees and anybody could have a go. One of these lines was 105 meters long and turned out to be an excellent training for the 119 meter long highline that Jerry and I rigged after this three-day-event in Consumes River George, a river deeply incised. As we rigged the line rather late, it got dark quickly during Jerry's and my first attempts, so that we saved our motivation and energy for the next day. After Jerry had reached the other side with several catches, I can watch him walking this line all the way in one direction without falling. He had attempted that project twice before and now I can share his happiness. Now it is my turn. After ten failed attempts I succeed in crossing the line with only three catches. While Jerry retensions the line on my request, I decide on an electronic song of the band Kollektiv Turmstraße. The first attempt feels damn good, but after 15 minutes the wind blows my hair in front of my eyes and makes me fall. So back to the start and a deep breath. What happens now is an unforgettable flow experience: inner calm and peace and continuous concentration enable me to react to every movement of the line in the right way. Especially when arriving at the middle of the line I tell myself: stay calm and relaxed. The second half feels much longer than the first one. The last 20 steps, now I mustn't fall! Overjoyed I finally reach the other end. 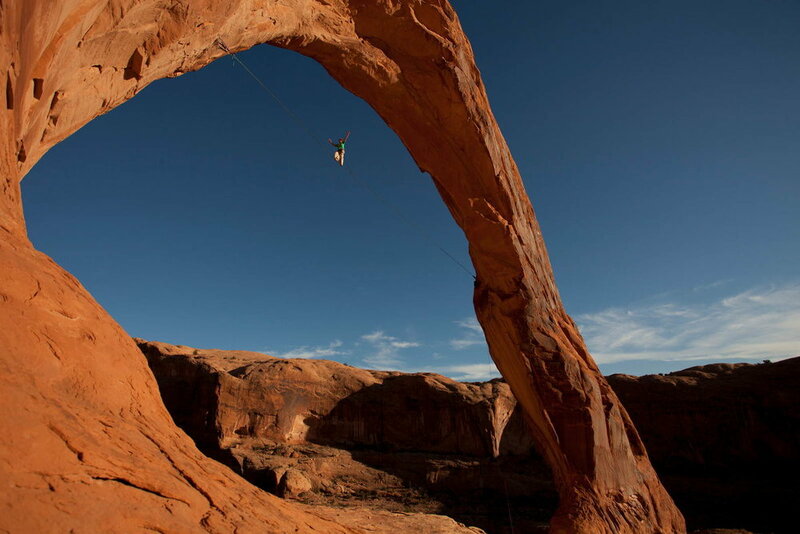 Jerry names the longest highline of the world “Bigger than Youros” hinting at the old European record. Here is a wonderful video of this time in California. We spent Christmas in San Fransisco. Instead of sightseeing in the fog we enjoyed the wonderful view of the metropolis disappearing in the fog and of the surrounding countryside from three highlines, which we rigged in the nearby hills. The motto for the last two weeks of our trip was friction climbing and highlining in the granite rocks of Joshua Tree National Parks in southern California with up to fifteen other highliners, with whom we spent New Year's Eve and New Year's Day. The most beautiful line for me there was “Asterdome” highline, whose anchor points have a difference in altitude of two meters, but you have an impressive view over the surrounding scenery, as it is the highest point in the area. After we had walked all the highlines in J-Tree and made accessible two new ones, we decided to leave for San Fransisco a little earlier than planned to walk four other highlines on the way back. The last one of those is called “Ballstrocity” and will always stay in my mind as the most beautiful highline of the whole trip because there is a fantastic view of the sea from there. In the end Lukas and I found out that during our trip we had walked exactly the same number of highlines as the number of days we had spent in the USA, that is: 57! Many thanks to everybody who made these two months the most beautiful and impressive two months of my life!!! I'd like to especially thank the photographer Jared Alden, who helped me realize the dream of a space line and who provided me with his pictures, and Grant Thompson, whose video about my trip is really worth watching. I'd also like to thank my sponsor Elephant Slacklines at this point.